Whether you were diagnosed with cancer as a kid, teen, or during college, cancer can leave your cash flow high and dry, your credit cards maxed, and your college career at a standstill. Thankfully, loads of foundations and organizations are beginning to recognize this situation. Grants and college scholarship for us young ones with cancer are sprouting up everywhere. Hunting them down, however, can be a long and winding google hunt. Until now. Enter on the scene: CCCpedia. Be one of the first to take a crack at the beta release of CCCpedia, which contains comprehensive and accurate information on over 100 organizations, totaling more than 3,000 scholarships and $5.8 million for young adult cancer survivors. The CCCpedia scholarship database is a new project of Carolyn’s Compassionate Children – and no, that’s not the name of a soap opera or a Danielle Steel novel; Carolyn’s Compassionate Children is a non-profit organization started by Carolyn Rubenstein, who may well win both the queen of overachievers award and the Parker Posey lookalike contest. Carolyn started the organization in eight grade. She is now 23-years-old and the organization has a staff of three people working for her. Let them work for you too! Have any of you ever applied for or received a college scholarship for cancer survivors? What was the experience like? Thank you so much for writing about the new database, CCCpedia. What you have done and are doing is so inspiring. Hopefully we can connect in the near future! 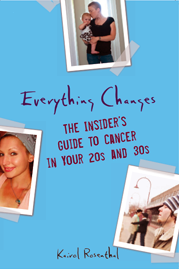 The last thing you want to think about after cancer is all the money you don’t have anymore, but you cannot avoid it. Samantha Eisenstein Watson founded the SAMFund, an organization for young adult cancer survivors. The SAMFund offers scholarships for ‘moving forward’ after cancer…anything from tuition to a gym membership to help with rent or reconstructive surgery. I was fortunate enough to receive a SAMFund scholarship for graduate school. I am in a debt of gratitude to Sam and the generosity of the SAMFund. I am pursuing graduate studies in to be a pediatric nurse and give back all the love I was so graciously given. Thanks for getting the word out about all these hidden sources of $$ for cancer survivors, Kairol! !